You can import contacts, companies, deals, tickets, or product information into HubSpot using a file from your computer. You can also import notes to be associated to records. Learn how to also import contacts directly from Gmail and through the HubSpot mobile app. Learn how to set up your import file. Include a header row in your file and match each column's header with a property. You can include values for any of the default HubSpot properties or custom properties. Email address or record ID for contacts. Company domain name property value or record ID for companies. Record ID for deals, tickets, and products. If you have the Automatically create and associate companies with contacts setting enabled, contacts will be automatically associated with company records after the import by matching the email address domain of the contact to the Company Domain Name on the company record. If you want to assign an owner to an object during the import, you can do this by including a [Object] owner column in your file and adding the email address of the user to each row in that column. Please note: users who are assigned a record through import will not receive a notification that they were assigned a new object. If you don't want to overwrite an existing value for a property, you can either include the current value in the relevant column or leave the cell blank. HubSpot will not overwrite a property value unless there is a new value present in the file. If you want to clear a property value, you can do so using a workflow (Professional and Enterprise users only). 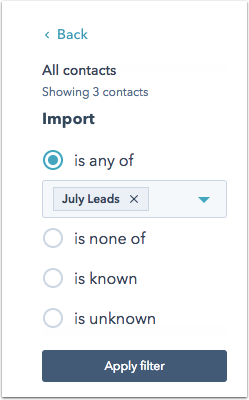 Please note: when the import file has duplicate contacts, HubSpot will import the information in any one of the duplicate rows to the contact record. To ensure accurate information is added to your records, ensure that there are no rows with duplicate email addresses in your import file. This applies if your CSV file contains only one object type (e.g., the CSV file contains only contacts). Select One file, and click Next. Select One object, and click Next. Click choose a file and in the dialog box, select your import file. 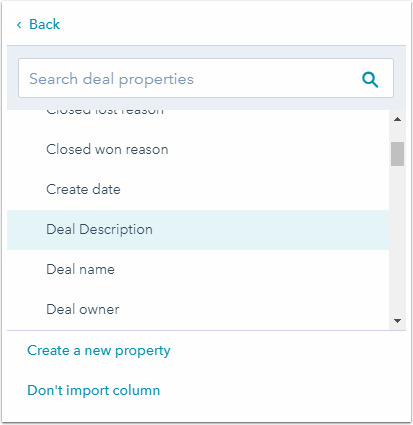 Select the checkbox if you're using the object ID to deduplicate your contacts, companies, deals, tickets, or products. In the bottom right, click Next. On the Map properties screen, HubSpot will automatically match the columns in your file to your selected object type's properties. You'll see a preview of the property values from your spreadsheet in the Preview Information column. Select an existing property to map the column to. Click Create a new property to set up a new custom property in the right pane. Select Don't import column to skip importing this column from your spreadsheet. You can also select the Don't import data in unmatched columns checkbox to skip any columns without a match. After you've mapped all of the columns from your file, click Next. On the details screen, enter an Import name. If you're importing a file with only contacts, select the Create a list of contacts from this import checkbox to automatically create a list when the contacts are imported. If you're importing a file with a date property, use the Date format dropdown menu to confirm how the date values in your spreadsheet are formatted. If you've turned on General Data Protection Regulation (GDPR) functionality in your account, use the Set the legal basis for processing a contact's data dropdown menu to select a lawful basis of processing. Once you've set the options for your import, click Finish import in the bottom right. This applies if your CSV file contains more than one type of objects (e.g., the CSV file contains contacts, deals and notes). You can choose to import notes along with each object as well. Select File from computer, then in the bottom right, click Next. Select Multiple objects, and click Next. Select the types of objects in your import file. Then, click Next. Click choose a file and in the dialog box, select your import file. Select the checkbox if you're using the object ID to deduplicate your contact, company, deal, or ticket records. Then, click Next. On the Map properties screen, HubSpot will automatically match the columns in your file to properties in your selected objects. You'll see a preview of the property values from your spreadsheet in the Preview Information column. Select the object and then, select one of its existing properties to map the column to. Select the object and click Create a new property to set up a new custom property in the right pane. This applies when you have two files, each containing its own object type. Learn how to import and associate records. Name: the name of the import that was added in the Import Details. New: the number of new contacts added. If a contact already existed in your database prior to the import, it will not be included in this value. Updated: the number of records updated by the import. Error count: the number of records in your import that resulted in an error and could not be processed. Click More > Download errors to see a detailed list of errors. Source: the type of import selected. User: the name of the user in your account who imported the file. Created: the date the import was completed. Hover over the name of the contact import. Click the More dropdown menu and select New list to open the list builder. Click the pencil icon edit in the top-left corner and give your list a name. Click the AND or OR to add more criteria to your list. Search for and select the Import radio button. Select the radio button next to the filter criteria is any of, is none of, is known, or is unknown. The click the dropdown menu and select the import file you want to segment by. Click Apply filter, then click Save. If you want to view your original import file, click More > Download original file.